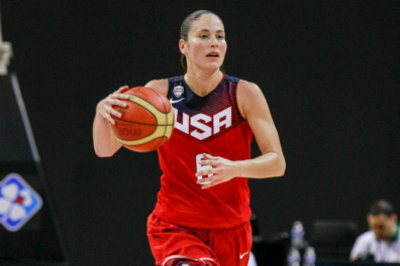 Sue Bird makes history in her storied professional and international playing career as the first player to play in four FIBA World Championships.
.@S10Bird, one of the most accomplished women’s basketball players ever, becomes 1st U.S. player to play on 4 USA World Championship teams! When you also add that she won a Gold Medal in two of her previous three trips 2002, 2010), along with all three of her previous Olympic appearances, that’s definitely a great accomplishment that we all should have deep respect for her. Not many players will have the longevity that she has had. I think it’s a testament to Sue. That’s a period of 12 years. She played right after graduating college. It is amazing that her level of play has been that consistent for that many years at a position that is not easy to play. That’s kind of who she is. She is very steady, very even keeled, unbelievable talented and wins. The players trust her, and they have confidence in her. And the coaches I think feel the same way. She’s like having a coach on the floor. We throw it out there like, ‘Wow, you’re a four-time USA World Championship Team member.’ If it were that easy, it would have been done lots of times before this. She’s accomplished something that’s very rare, and she should be very proud of herself. Among the remaining players, seven are from the 2012 Olympic team. They include Bird as well as Seimone Augustus, Tina Charles, Angel McCoughtry, Maya Moore, Diana Taurasi, and Lindsay Whalen. Among the newcomers, Dupree makes her second FIBA World Championship team, while it is the first time that Griner, Ogwumike, Sims, and Stewart will play on the team. Ogwumike, Griner, and Sims are the first players from the 2012, 2013, and 2014 rookie classes to make a Team USA FIBA World Championship squad, respectively. Stewart is the lone college player on the roster. Congratulations to the players for making it to the team, and time to get that Gold Medal.